Plot to build 450 sq m villa or 3 townhouses - Property for sale. Full Description: Plot with 1600 sq m of total area and capacity to build a single family house with swimming pool with construction area up to 450 m2, or 2 or 3 smaller townhouses. Plans are already drawn up for both projects. From the rooftop terrace it is still possible to see Vilamoura and the Atlantic Ocean. 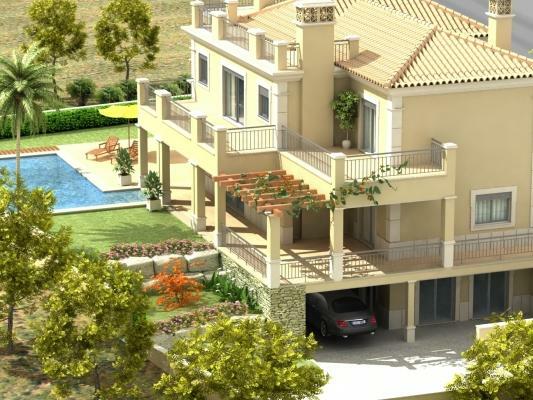 The plot is in a quiet country area with good access, water and sewer infrastructures and very close to Vilamoura. Excellent location with easy access to the EN125 and the motorway. Option to buy the completed project with a high standard of construction according to the general specification list. Also an option to buy the adjacent rustic plot of around 7,500 sq m for an additional 30,000 euros.